I read this article and found it very interesting, thought it might be something for you. The article is called Reducing Gossip in the Workplace and is located at https://teamperformanceus.com/2014/03/reducing-office-gossip/. 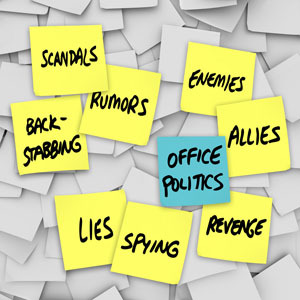 I worked with a client in a small town with people who have known each other all their lives so office gossip was a natural part of their community. Upon completion of their culture assessment, we discovered that gossip was more rampant than what we previously thought. To understand more, we explored what gossip meant to them. We subsequently divided gossip into two categories: wasteful gossip and hurtful gossip. Furthermore, they determined that gossip was costing them 19% of their productivity and time. For a 50 person firm, they calculated that wasted productivity amounted to a cost of 1.9 million dollars over a 6 month period in payroll costs alone. As with the example above, all gossip falls into two categories: There’s wasteful gossip, which we’ll call water cooler gossip. This gossip involves discussions pertaining to partners, spouses, children, events, the weekend, etc., and it’s relatively innocuous. The second type, hurtful gossip, is anything that damages the listening of another. Stated another way, hurtful gossip diminishes another person’s character and the way people see them. There is a certain amount of benefit to water cooler gossip in that it causes people to bond, but what are the things we can do as a leader or manager to take it to a healthier level? If you think about it, gossip is the need to connect. When connecting, people do what is most comfortable; so what if we taught people a new way to connect? Create a team quiz every week—come up with three questions that everyone participates in and then at the end of the week you share results. Create a bowling league or softball team where people can play together and bond. Create a fun off-site team building retreat every quarter or bi-annually. Offer a membership to a local gym and encourage team members to get healthy together. Another way to reduce gossip is to create a culture of openness and transparency which we’ll cover in another post. This reduces the employees’ need to make up stories, gossip, and fill in the blank. When you start to integrate new behaviors into everyday life and give people new reasons to connect that are healthier, then gossip starts to decrease and more fun, spirited work environments emerge. Share your stories of how you are creating more connection and teamwork in the workplace.